The Financial Industry Regulatory Authority (FINRA) appreciates the opportunity to respond to questions concerning "Model Notices and Plan Sponsor Education on Lifetime Plan Participation" posed by the U.S. Department of Labor's Advisory Council on Employee Welfare and Pension Benefit Plans (ERISA Advisory Council). Our comments focus on lessons learned from research funded by the FINRA Investor Education Foundation (FINRA Foundation) and the numerous outreach and educational initiatives that FINRA and the FINRA Foundation currently have underway—and are not limited to the context of employer-sponsored retirement plans under ERISA. FINRA is the largest non-governmental regulator for all securities firms doing business with the public in the United States. FINRA oversees more than 4,030 brokerage firms and more than 638,320 registered securities representatives. We touch virtually every aspect of the securities business-from registering and educating industry participants to examining securities firms; writing rules; enforcing those rules and the federal securities laws; informing and educating the investing public; providing trade reporting and other industry utilities; and administering the largest dispute resolution forum for investors and registered firms. FINRA believes that investor education is a critical component of investor protection-and that we are uniquely positioned to provide valuable, unbiased educational information and tools to retail investors. Over the last decade, we have developed a strong outreach program, including producing alerts, interactive tools and Web content to help investors make informed financial decisions. Our BrokerCheck tool, for example, provides investors with a quick way to check a broker's disciplinary and professional background. Encouraging people to take this simple step before doing business—or continuing to do business—with a broker is part of our greater commitment to protecting investors. In 2003, FINRA created the FINRA Investor Education Foundation, which seeks to provide underserved Americans with the knowledge, skills and tools necessary for financial success throughout life. To date, the FINRA Foundation has approved more than $100 million in financial education and investor protection initiatives of national scope and significance through a combination of grants as well as targeted projects managed directly by FINRA Foundation staff. ? American consumers are not monolithic, which means mass-market, one-size-fits-all materials are less likely to yield desired results than those specifically tailored to a targeted audience. In creating financial education content and encouraging investors to use helpful tools, FINRA's Office of Investor Education (OIE) and the FINRA Foundation utilize social marketing principles and integrate behavioral economics concepts whenever possible. We describe these processes in detail below. We also highlight relevant findings from FINRA Foundation-funded research and provide examples of FINRA Investor Alerts on retirement-related topics. Keep messages and materials short and simple. Focus on one key issue or action, use plain language and be sure to define or clearly explain legal terms and complex concepts. Avoid the tendency to include every conceivable messaging component in a single document or marketing campaign. Layer information to better highlight the most pertinent information while allowing for additional mandatory or voluntary information. For web-based communications, this includes linking; for print, consider judicious use of call out boxes or fonts and colors to surface key points (such as deadlines or action steps). Whenever possible, consider engaging a variety of communications channels to reach workers, from text message reminders to pamphlets to employee messaging in public spaces (like break rooms). Recognize the link between financial decision-making and psychological biases, and be sure to balance emotional and logical appeals in notices and educational materials. Align message delivery with key milestones in the worker's life—anniversaries, birthdays, pay raises or promotions. Consider messages that foster communication about retirement savings with the worker's spouse or partner. Whenever possible, provide an opportunity to act when delivering messages that encourage action (for example, an email acknowledging a promotion or annual pay increase might include a "pay yourself first" message suggesting the employee increase their retirement plan contributions and link to the plan provider's website). Such small nudges and reminders can yield significant results. FINRA's OIE and the FINRA Foundation regularly create or review educational materials and tools aimed at a wide range of U.S. adults, including low- to moderate- individuals and younger workers as well as seasoned retail investors. We use the principles of social marketing to guide our work-and we strive to integrate lessons learned from behavioral economics. Social marketing involves the application of commercial marketing concepts to the planning, delivery and assessment of efforts aimed at changing the voluntary behavior of target audiences, where the desired behavior change typically involves improving one's personal welfare. The concept recognizes that efforts to eradicate social problems—such as promoting seat belt usage to reduce motor vehicle deaths and injury or encouraging retirement savings—demand behavior change, not merely changes in attitude or understanding. Fostering behavior change at an individual level requires deep knowledge of your target customer—and this, in turn, involves understanding the costs and benefits of the desired behavior from that person's perspective, being aware of the competing messages that counter yours, and identifying and overcoming barriers that might prevent those who want to change behavior from doing so. For example, because consumers and investors do not always know what they do not know, they often do not seek information prior to making a financial decision—nor do they appear to know about and use available tools and other resources to help compare financial products and services. And on a daily basis, consumers encounter a vast array of commercial messages and marketing campaigns, which can lead to impulsive decision-making. As a result, financial educators-especially those proffering unbiased, non—commercial and non-product—specific resources-compete in an extremely crowded marketplace. Behavioral economics suggests that individuals do not always make logical financial decisions—and that psychological and emotional biases can cause us all to make sub-optimal choices.7 And emerging research in interdisciplinary fields such as neuro-economics separately suggests that brain function plays a role in financial decision-making.8 The challenge is that many individuals go through life not recognizing that these biases are at work, often with negative consequences. Some individuals optimistically believe, for example, that they will have enough saved for retirement even though they have not yet begun to contribute to an available retirement account (overconfidence bias). Alternatively, they might seek out evidence that supports their belief they have saved enough or do not need to save (confirmation bias). Deliver positive reinforcement to encourage continuing savings behaviors. Harkening back to the first principle of social marketing above, both OIE and the FINRA Foundation firmly believe that evidence-based solutions and initiatives grounded in research have the best potential for success. Among the innovative research projects the FINRA Foundation has supported over the years are projects aimed at improving disclosure to investors, understanding the biases that often underpin faulty decision-making and identifying methods employers can implement to help workers save for retirement. High-level findings from the most relevant of these projects are summarized below. Used the power of compound interest to their advantage by saving and thus earning interest rather than incurring debt and having to pay interest or late fees on debt loads. Providing basic retirement plan information to new employees, including simple descriptions of the plan and its offerings. Focusing on improving the overall financial knowledge of workers. Customizing educational materials to meet the needs of different audiences. Recognizing that the ability to save for retirement is influenced by the worker’s debt levels and overall financial health. Integrating automatic features to boost participation in the plan. Giving thought to default options, setting them at least at any match level and considering automatic escalation. Offering financial education and coaching. Educating workers about financial risks. Periodically reminding employees about the plan and its benefits. Some of the findings in this short report derive from a larger research project by North Carolina State.13 Researchers collaborated with human resources managers to evaluate the extent to which workplace education programs improve employees’ ability to understand their options relating to timing of retirement, the age at which to begin Social Security and pension benefits, Medicare, annuitization and other matters pertaining to asset management in retirement. The project included creating a template to help employers evaluate their pre-retirement programs. One important finding relevant to the content of employee notices and plan sponsor materials related to common informational errors employees make concerning “retirement age.” Workers who thought Social Security and pension plans set retirement ages at a higher level than actually is the case stated they planned to retire later in life. In contrast, workers who thought the retirement age was lower than was actually the case often stated they planned to retire earlier. This underscores the importance of providing comprehensive information to employees in digestible chunks to help dispel reliance on erroneous assumptions. Accountability: Providing short, motivating “reminder” messages to save prior to a deadline (made through an automated calling system) appeared to increase savings rates in a controlled experiment over two-years. Holding people accountable in this way can be a powerful psychological motivator. Each alert aims to tackle a single topic and provides background on the issue, a short list of considerations and action steps for the investor. We link to additional resources to layer the information for those who might want to learn more. In addition, we use a mix of format, with narrative and lists. We have also compiled an array of educational articles on retirement topics, all of which are available on the FINRA website at http://www.finra.org/investors/retirement. Until recently, we presented some of our general financial education information (including articles on saving for retirement through a 401(k) plan) in a more encyclopedic, e-book format. We found, however, that visitors to our website would browse title pages for each chapter without necessarily proceeding further. We took advantage of a recent website redesign to break up our presentation of this information into discreet, manageable topics, linking content with tools to foster action. 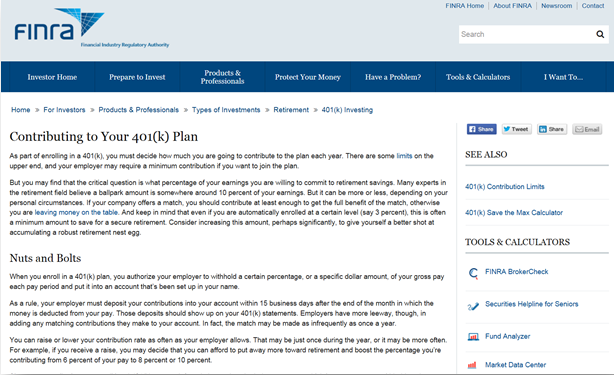 For example, our article titled Contributing to Your 401(k) includes narrative information on matching and also a link to our Save the Max tool, which helps workers understand how much they need to set aside each pay period to save at least as much as their employer will match. We appreciate the opportunity to submit this statement. FINRA and the FINRA Foundation are committed to expanding the knowledge and confidence of all Americans wishing to build a more secure financial future through saving and investing, and we share your interest in resources and messages that lead investors to make sound financial decisions. 1 Alan R. Andreasen, Marketing Social Change, at 110 (San Francisco: Jossey-Bass, 1995). Social marketing can identify initiatives that may be used to influence the behavior of people (downstream social marketing) as well as government, media, businesses, legislators and community leaders among others (upstream social marketing). 2 A 2009 survey of more than 28,000 American adults found that 53 percent of respondents had used a financial professional in the preceding five years-but, among that 53 percent, only 14 percent reported checking with a regulator regarding the professional's background, registration or license. See National Financial Capability Study: State-by-State Survey (available at www.finrafoundation.org/capability). In consultation with the President's Advisory Council on Financial Capability, academics and staff from a host of federal agencies, we fielded a second wave of the study in 2012. Although the second wave did not include this question, a third wave, currently in the field, does. Results from the 2015 study are expected to be available in the latter half of 2016. 3 See FINRA Foundation Social Marketing Toolkit (2008) (prepared by Professor Punam Keller, Tuck School of Business, and available at www.finrafoundation.org/web/groups/foundation/@foundation/documents/foundation/p118440.pdf). 4 Id. See also Tuck Executive Education at Dartmouth & FINRA Investor Education Foundation, Using Social Media, Social Marketing and Brain Research to Improve the Design and Delivery of Financial Education (2010) (available at www.finrafoundation.org/web/groups/foundation/@foundation/documents/foundation/p124107.pdf). 5 Tuck Executive Education, supra note 4. 6 FINRA Foundation-funded researchers have examined a broad range of issues affecting the investing public, including gender and ethnic differences in investing, psychological biases that prevent wise investment decisions, how best to deliver investment information, whether employer-provided education helps workers plan for retirement and the effectiveness of various approaches to improve the financial wellbeing of different audiences. Details on these research projects can be found at www.finrafoundation.org/resources/research/index.htm. 7 To promote investor awareness in this respect, the FINRA Foundation funded a grant through which Nightly Business Report and Kiplinger's Personal Finance produced a series of coordinated broadcasts and companion articles exploring behavioral finance and its implications for investors. See www.finrafoundation.org/grants/. We also awarded two grants to researchers from the Psychology and Public Affairs Departments at Princeton to examine how psychological biases play a role in investment decisions. Findings and related articles are available at www.finrafoundation.org/resources/research/. Don't Stop Thinking about Tomorrow: Individual Difference in Future Self-continuity Account for Saving (PDF 128 KB). 9 The full, hour-long documentary is available for online streaming from Maryland Public Television (at http://video.mpt.tv/video/2365353075/). 10 Eccles, David W., Paul Ward, Elizabeth Goldsmith & Guler Arsal, The Relationship between Retirement Wealth and Householders' Lifetime Personal Financial and Investing Behaviors, 47 J. CONS. AFF. 432 (Fall 2013) (available at http://www.finrafoundation.org/web/groups/foundation/@foundation/documents/foundation/p444960.pdf). 11 These educational materials are available at www.FINRAFoundation.org/PDF/FinanciallyFit. 12 Clark, Robert L. & Annamaria Lusardi, How Employers Can Help New Hires Save for Retirement: Best Practices that Build Long-Term Financial Security: Top Ten Best Practices (2012) (available at www.finrafoundation.org/web/groups/foundation/@foundation/documents/foundation/p188046.pdf).